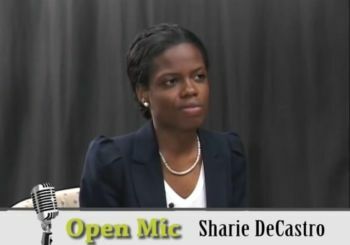 ROAD TOWN, Tortola, VI- She may be just 24 years of age but Sharie B. de Castro, the youngest candidate in the 2015 general elections of the Virgin Islands, continues to demonstrate a maturity beyond her age and that she has what it takes to be a competent representative in the Third House of Assembly. de Castro, a former school teacher and Miss British Virgin Islands, skilfully and fluently articulated her vision for the territory during a recent interview on Open Mic with Julio S. Henry. The Virgin Islands Party Territorial At Large candidate revealed her ideas on improving tourism, education, youth development programmes, representation, as well as fighting crime, among other issues. Her delivery was impressive enough to make Mr Henry scoff at a recent criticism of the female candidates on the Virgin Islands Party slate by former legislator Mrs Eileene L. Parsons. Asked why she decided to contest the elections on the Virgin Islands Party ticket, Ms de Castro said the party's vision and principles are aligned with her’s as an individual. Further, Ms de Castro said the Virgin Islands Party, especially with the new slate of candidates, have been revitalised and consists of members, who are genuine, and who can relate to each other on issues in a frank and respectful way despite their different professional backgrounds and views. The educator said some of her fellow VIP members have even been her mentors, such as Dr Karl Dawson and senior VIP member Hon Andrew A. Fahie (R1). On the topic of crime, especially gun crime being one of grave concern for the territory, Ms de Castro said it was better to be proactive rather than reactive and suggested that there should be more programmes and activities in place for young people, especially to be more involved in the things they love to do so they don’t have time for anything else. “We should not focus on the back end of crime. We have seen a lot of remodelling to the prison and we have seen courts being built but what about our schools? Can we say that infrastructurally we have done as much to our schools as we should have? So I believe we have been reactive. “But the idea is to implement programmes that would ensure that our young people, whether it is through sports, education, the arts, whatever it is, get them involved in the community and in so doing they would be able to positively contribute. They wouldn’t have time to do anything else,” Ms de Castro opined. The youthful de Castro said she would champion youth issues and would constantly engage them so as to ensure proper representation. You can dislike all you want but we have made up our minds. Please post her interview so people can see this brilliant little lady,s vision. Three educators Fahie, Dawson and Decastro on the VIP team. With these three there's hope for the youths. Let's put them to work people. I already vision a better BVI. Honest, clean, fresh, spiritual, purpose driven, indigenous, visionaries, respectful, compassionate, representation. NDP 7 ----VIP 6-----------Pickering minister of health and environment-----Marlon, minister of Labour and Agriculture ...My wish....... Marlon if you don`t get a ministry join VIP to be the deputy...time you move up, or move on.